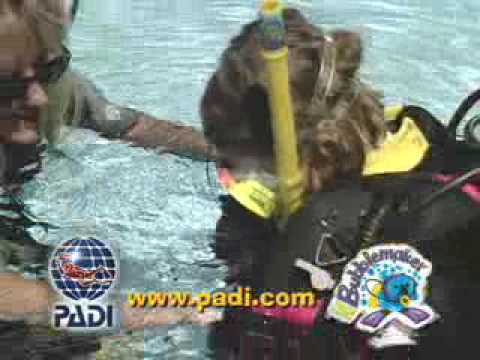 What a great way to introduce children to scuba diving in a pool in less than two meters of water. Celebrate a birthday by throwing a memorable, exciting Bubblemaker party with friends and family at our PADI dive center. It’s fun, easy and safe. Bubblemaker is as fun as it sounds – a chance for kids to blow bubbles by scuba diving. Children who are at least 8 years old can use scuba gear to breathe underwater and swim around in shallow water. A child must be 8 years old or older. Kids must be comfortable in the water, but no prior experience is necessary. Parental approval is required. Contact us now to schedule a Bubblemaker program. In the Bubblemaker program, participants get a basic introduction to how to use scuba gear, how to clear a regulator and mask, and an overview of breathing do’s and don’ts. Your local dive shop will advise you about anything else you need.